In the southwestern parts of Jutland lies The Wadden Sea protected from The North Sea by the many islands. The landscape is flat and the vegetation is under influence of the nearby sea. The tide carries a lot of fine clay material, which during the high tides is deposited causing the land to rise slovly. There can be a difference between the low and high tides of up to 2 meters. The local inhabitants have during long time tried to increase the rate of creation of new land by different means. They have built large "deposit-yards" and planted salt marsh grasses to catch the clay material. These efforts can still be seen near the coasts of The Wadde Sea and the islands there. The clay material is very rich in nutrients and the deposits contain large amounts of small snails, worms and crustaceans. The area therefore attracts a large number of birds especially in spring and autumn. The Wadden Sea is a nature reserve (Natura 2000) under EU legislation. 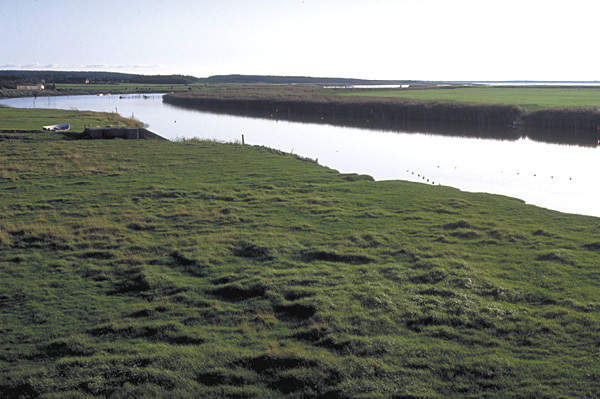 The picture to the right shows the river Varde Å slowly floating through the salt marsh in the Wadden Sea. Varde Å is the only unregulated river in The Wadden Sea.